While we are best known for our delicious and hearty Great Northern Beans, we offer a variety of other beans sold in our signature jars including Kidney Beans, Pinto Beans, Black Beans, Mixed Beans, Garbanzo Beans, Navy Beans, Black Eyed Peas and brand new Ultimate 4 Bean Mix. 48oz. 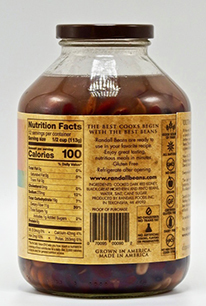 jars of Organic Great Northern Beans are available. Our new Ultimate 4 Bean Mix is currently only available in the 48oz. size. 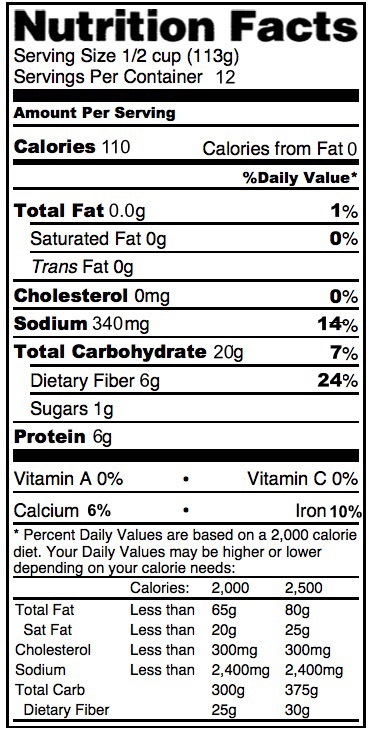 Most all other regular varieties are available in 15.4oz., 24oz. and 48oz. jars! The bean that started it all. 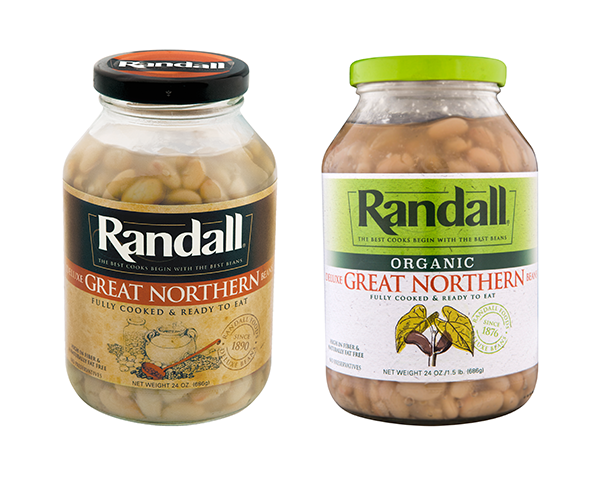 Back in 1876, Grandma Randall developed her secret recipe for great northern beans, the recipe we use to this day. Great northern white beans are plump, luscious and creamy with a slightly pinkish hue. They’re ideal for salads, bean dips and Randall Beans’ award-winning White Chicken Chili. These are brick-colored beans with a white interior bring earthy flavor to Southwestern dishes. 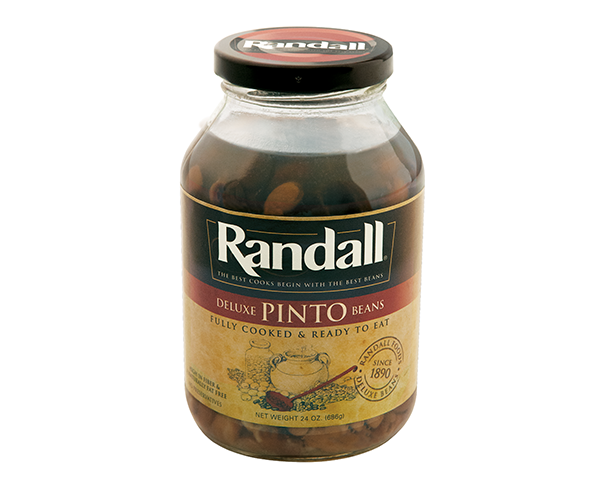 Pinto beans are also used to make re-fried beans in Mexican cuisine. These sturdy little white beans, once a staple of the US Navy, are ideal for soups and baked bean dishes as they maintain their shape, color and flavor through the long, slow cooking process. They have a wonderful, smooth texture. 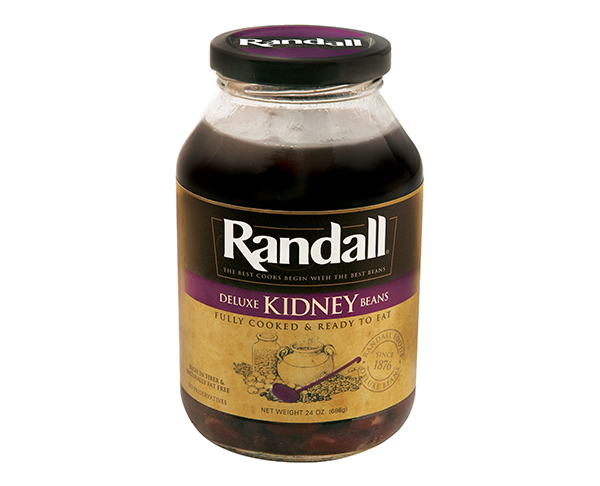 With their rich ruby color and large size, red kidney beans are an elegant choice. They’re a colorful addition to picnic salads, but also a great ingredient in more hearty dishes like as sausage and kale soup. This work-horse of Mediterranean and Middle-Eastern cuisine are giant, pale yellow and creamy. Toss chickpeas in a salad, whip up flavorful hummus or even serve them with pasta. 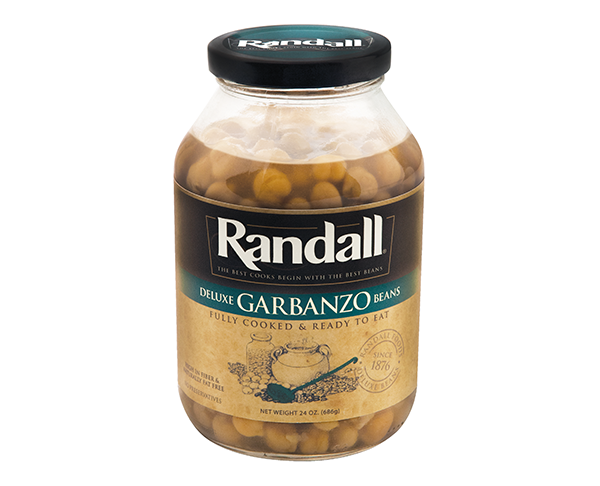 However you cook them, garbanzo beans are always delicious and fabulously healthy. Black beans are not really black, but they are very dark. Their slightly smoky flavor makes them a favorite in Caribbean and Southern cuisines. Our “Zorro” variety of black beans come mostly from Michigan and has a beautiful and rich eggplant color. Our favorite good luck bean is traditionally served on New Year’s Day to guarantee good fortune for the coming year. 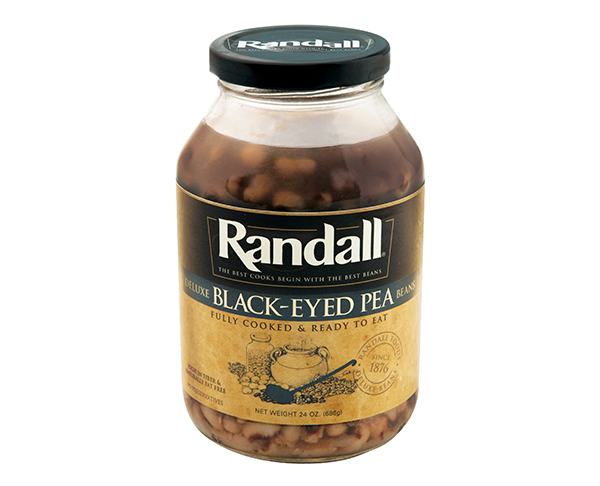 Black-eyed peas have a wink of a dark eye and an ivory coat. One of our favorite recipes is deep-fried black-eyed peas; tossed with salt and pepper, they make a great snack. Can’t decide which bean to eat? Then eat them all! 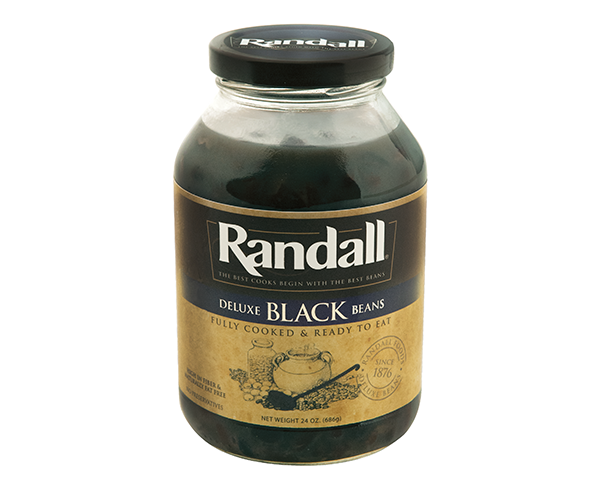 Randall’s Mixed Beans are a delicious mixture of seven different beans. 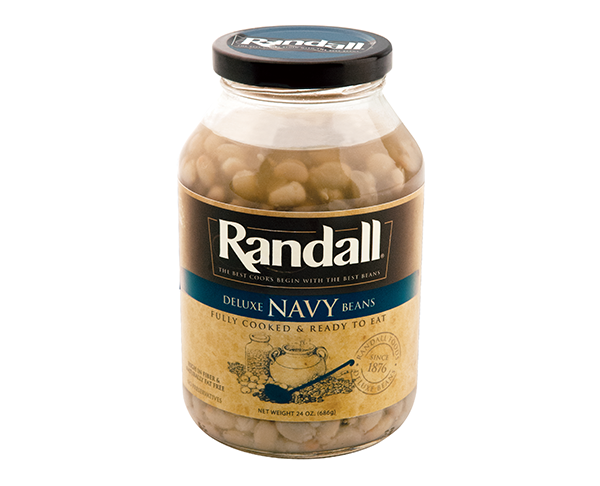 Drained and tossed with your favorite dressing, they make a great bean salad. Add them to almost any soup or to sautéed onions, peppers and meat of your choice and you have a complete meal. 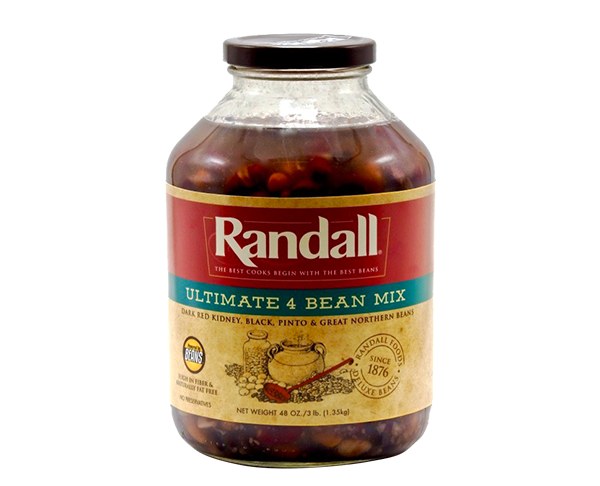 Randall’s Ultimate 4 Bean Mix is a winning combination of Black, Great Northern, Pinto and Dark Red Kidney Beans. 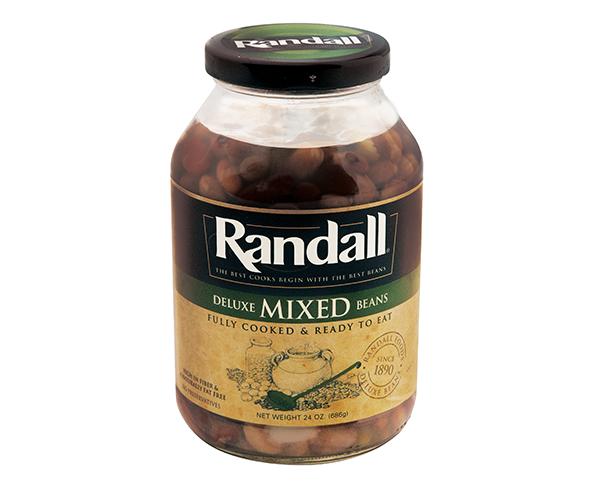 A perfectly-balanced bean mix and, as always, in a glass jar.